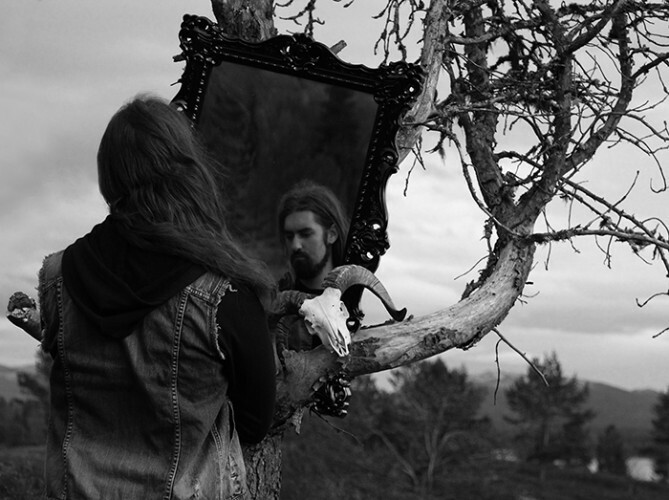 Vyrju began as the one-man project of Norwegian musician Jan F. Lindsø, but Vyrju’s debut EP Black also features session drums and clean vocals by Tim Yatras (Germ, Austere, ex-Nazxul, ex-Woods of Desolation). 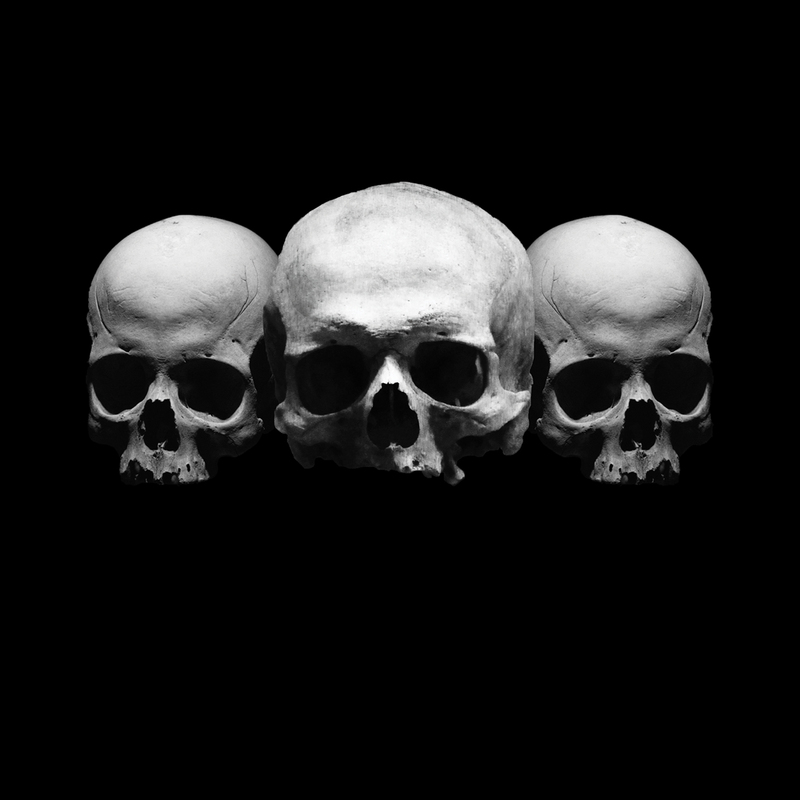 I’m a fan of Tim Yatras, and it was his participation in the recording that originally attracted me to it — well, that and the three big skulls on the EP’s cover, of course. In a word, Black is captivating. The melodies in each of the four songs, with the exception of the short instrumental piece “Gone”, have a sombre and even depressive air, but they’re memorable and often beautiful in their own grim, ravaged way. “The Constant Void”, which opens the EP, is built on a foundation of big, heavy, rocking riffs that are catchy as hell. The song also includes intervals of double-bass thunder and piercing tremolo melody that, together with Lindsø’s high, jagged howls, escalate the music’s emotional intensity as those hook-laden riffs continue burrowing into your head. Like the opening track, “There Is No Grave Big Enough” is a long, mid-paced song whose melancholy atmosphere is accented by both acoustic and electric guitar arpeggios that beautifully complement the moving waves of tremolo riffs. In this song, Tim Yatras’ high clean vocals, plaintive and pained, share time with Lindsø’s agonized shrieks. The third track, “Gone”, provides a relatively brief moment of contrast. An instrumental piece constructed from a layering of acoustic and electric guitar joined by cymbal crashes and the drive of Yatras‘ drumming, “Gone” has a lighter, almost lilting atmosphere but is no less catchy than the darker tapestries of sound that precede it. “The Residue of Life” closes the EP, with Yatras‘ high wails again sharing time with Lindsø’s caustic blasts of vocal acid. There are hard edges in the song, thanks to bursts of blasting drums and double-bass thunder along with hailstorm riffing and jabbing chords, but like all the other songs on the EP its morose melodic hooks are so potent that the music persists in your head long after the sound has stopped. Black succeeds in blending moods of anguish, aggression, and bleakness, with catchy rhythms and interwoven strands of seductive melody that make Vyrju’s debut the kind of melancholy black metal that will pull you back into its embrace again and again. Strongly recommended. Black will be released by Black Forest Records on December 1, both on CD and as a digital download, and can be pre-ordered at Vyrju’s Bandcamp page. Below you can listen to excerpts of each song in the YouTube player, and I’ve also included the full track stream of “The Residue of Life”. Awesome stuff – can’t wait to hear the whole thing.